Club Penguin Cheats by Mimo777 Club Penguin Cheats by Mimo777: Club Penguin Pin Cheat - BAT PIN! Club Penguin Pin Cheat -BAT PIN! 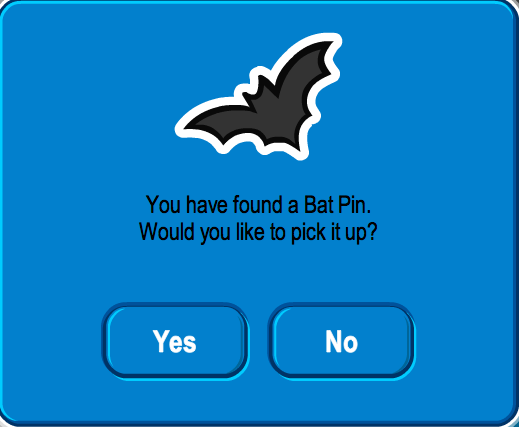 Here is how to find the new Club Penguin BAT PIN cheat. Step 2. Now go to Cove. Step 3. Go to the far left corner. Here is how to find the new Club Penguin GOLD FEATHER PIN cheat. Step 3. Now click on the pin! Play New Game Topsy Turvy! Do u think Gary will be at the haloween party?I hope so. I was really looking forward to a cake pin with this year's anniversary party colors! Oh, well. At least they're still a surprise. Do you think Gary will be at the haloween party?I hope so. speaking of pins what was ur first one? mine was a butterfly. I like the new pin too! It goes great with several Halloween backgrounds! There is a background at the gift shop that i can't really buy. It says "buy undefined for undefined" Why can't I?? Actually, Gary the Gadget guy is at every Halloween party, in a secret room in the shelves in the book room. There, you will find a secret lab! Good luck trying to meet him! No it won't! Are you kidding me? There was a saying that the bats were some creature from Gary's inventor. Plus, they remind me of the game Puffle Rescue! There pats that are helpful in level 6. And did you just say you are going to become a sushi for Halloween? O.M.G.! the bat pin is really cool! you can wear it with the EPF earpiece, the goggles from veggie villain and a dark halloween background. it goes perfectly! there is a glitch, when u look in the top left hand corner, left of the newspaper, you can see random penguin names popping up every now and again?! check it out. Just wondering if anyone else had seen the added jokes when you click Joke on the riddle and joke page. I cant wait for the anniversary and halloween party, its going to be amazing. Cool eh? Hope that helps the people who are still wondering about Card Jitsu water! OMG! Thank you Mimo I was trying to find it all day but couldn't so I just gave up lol. But THANKSS! Isn't it a little weird that there are 2 pins out on the same time oh and by the way (sorry for capps didn't mean to hurt ur ears). I was at the dojo and realized that there are 3 floors to the dojo! I wil <3 The Party! The bat pin is really epic! It's my first halloween pin i have collected! I hope he is! He is really fun to meet, but he doesnt stay for that long. Hopefully we can find him! That is probably the best halloween costume ever! This year, im going as an evil snowman! Mwahahahaha! The butterfly one is pretty rare! I really like the lollipop one. That's the one im using for my halloween costume! I can't wait for the parties too! They sure are going to be amazing! 1. Click on your playercard and put on the drilling hat. Remove everything but your drilling hat. It will look like you are drilling without a drill. 2. This isnt a glitch but when u dance, you used to be able to start again but nw you have to walk and click dance. I was really looking forward to a cake pin with this year's anniversary party colors! Oh well at least theres still a surprise. Probably, like the years before! :D I hope too! 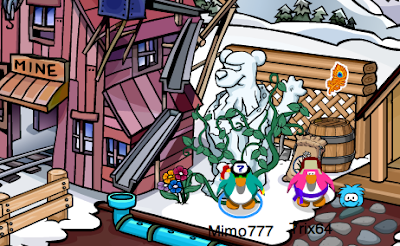 CP is having a lot of glitches. All backgrounds are 60 coins, if that helps. P.S. Sorry if that came across mean, I didn't mean for it to sound that way! How so? You mean when you look at the outside? well if you try really hard you might be lucky and see him in his secret lab .i have seen him i was over the moon . A sushi? Suuuusshhiii! Are you planning to buy that costume or make it? I was too! Maybe they will release one the day of the Anniversary Party. Must be a glitch. Club Penguin's been REALLY glitchy lately. Hope they fix all the glitches before the big Anniversary. The big 5! Sorry, you're a little bit too late. Mimo already knows. Scroll down a bit to see his post about it. Bummer. Which team was it? Ohh, cooool. Must be penguin martians coming from the sky! Thats ok. If you don't find a question comment then you could give advice to other comments. Yep, Down Floor, Up Floor, Left Floor, Right Floor, Front Floor, and Back Floor! Wait... That's six floors... Oh great, now im all confizzled! This glitch happened to me in the September. Just be patient wait a couple of weeks (probally 2 or less) I tryed to get the september background and it wouldnt let me. So I waited and I did it again and I got it! Hello, Limadude! My first pin was also the butterfly! Mimo's first pin was the box that says "UP" with an arrow. That pin was realeased on April 2007. Hello, dorothyh123! First try logging off and back on. If that doesn't work, try clearing your cache. If that still doesn't work, contact Club Penguin telling them your bug. Cool!mine was the candy cane pin in dec.06! He will, he goes to every Halloween party. His secret labratory is the behind the pool. idk if this is a cheat for u maybe its just for me but when i try to go onto big screen it says "oops, you may have taken a wrong turn! "Its bad for me because i have dial-up internet. I hope so! Nothing has been said about him been at the party but I'm sure he will be! He is at the party every year. I wonder, wil be there 5th Anniversary Cake Pin, like It was last year!? I cant find it! i went to the forest but its not there! Also i tried to do the field op by going to the beach like u said and it didnt work! im so confused. limadude said...speaking of pins what was ur first one? mine was a butterfly. Mimos first pin ever was the box pin. maybe on the day of the anniversary party! i dont think cp would have released it before because it would have spoiled the colour secret for the party hat. I noticed that as well. Mimo might give you credit if he puts it on the blog. Hello, Kjdpenguin! First try clearing your cache. If that doesn't work, contact Club Penguin telling them your bug. Hey mimo! Did you notice that club penguin now added the orange puffle to puffle round-up? I was playing it today and noticed. The pin is at the cove and try standing in the certain spot at the beach. I think so he does ome mostly every Halloween party. Go to the cove to get the bat pin & the beach thing go to the bottom corner. Hope this helps! Cool! My first pin was the spider pin. I don't remember where I found it though. Mimos was a box and mine was a magnifying glass! I cant wait for the halloween party! Im dressing up as a faery, but the cp faery outfit is rubbish apart from the wings! So im wearing them, a dress from the medieval party, twees wand, and a red star hairdo! Another good one you can get now is the Pharohs headdress and frankenstine girls dress! It looks realy cool!!! Sorry I haven't been modding and commenting and stuff but i've had some stuff to do, I've finished it now and i'm on holiday so I can mod now! I think he will! He usually turns up to the halloween party's. Here's a tip, look for him at the mad science lab. Mine was a pyramid. But I was like sorta late joining so I don't have as many as some ppl. It's just a glitch. It should be fixed soon! The halloween party will cheer you up...or just scare you silly but anyway it'll be pure awesomness. What team do you support? 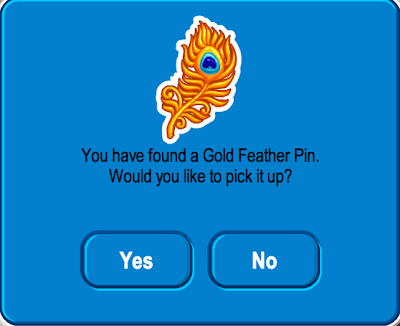 They could have a silver puffle, brown puffle, rainbow puffle and gold puffle. Those are just the ones i'd like, I'm sure club penguin has ideas for more puffles. Yeah! That happened to me aswell! 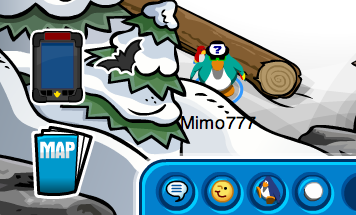 What has happened to Club Penguin, there's glitches galore! The fair is so cool! I love it! There is even art at the book room now! Clubpenguin is so cool! P.S. Don't put CPG MOD when you aren't modding! Thanks! I have a friend that is always going on my account, and she deleted half of my full buddy list, and now I have a whole bunch of buddies that think I'm a dude. hmmm... can you help me? I think this is my first halloween one aswell! Either that or i've forgotten about my other ones or something. And I have the same problem about modding aswell, Some days I just can't because of homework and projects but I try to get it done as soon as possible! For the feild op ust keep trying in different parts of the beach and for the pin just come back later and it might show up, it's probably just a glitch. Spider pin came out in 2007 :) just thought you would like to know Muddy Duki.